The Sumerian settled in the vicinity of the Tigris and Euphrates rivers, near its mouth in the Persian Gulf. 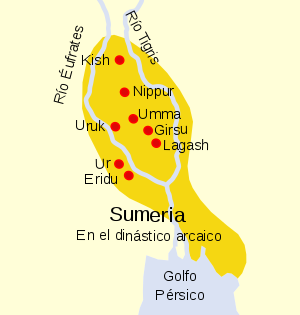 This region is known as Sumer. It is aware of its existence around 3500 BC although its origin is not clear at all. It is not known with certainty whether the Sumerian were indigenous people of Mesopotamia or moved from a nearby area. Mankind owes to the Sumerian a huge set of advances that meant a great transformation in all aspects of life. Perhaps the most important was the invention of the wheel around 3500 BC and the invention of cuneiform writing around the year 3300 BC but we must not forget that they were the precursors of the first cities (Umma, Uruk, Ur, Eridu, Nippur, Kish and Lagash among others). The Sumerian left us the first written laws, they were the inventors of the sexagesimal system, the beginnings of medicine, and constructions of mud bricks and architectural arches. 3500 B.C. Appearance of the Sumerian in Mesopotamia, is the Uruk period, perhaps the most thriving city which gives its name to this first period. The main Sumerian cities struggle and struggle to achieve military supremacy in the region but for the moment none is clearly able to dominate the rest. 2340 to. C. Lugalzagesi from the city of Umma achieved the first unification of Sumerian cities defeating Lagash, Uruk, Ur and Larsa. 2340 B.C. Sargon, an Akkadian leader gains power in Agadé and Kish, and defeats Lugalzagesi, thus beginning the Akkadian Empire. 2220 BC The Akkadian Empire falls against the nomadic tribes of the Amorites and Gutians. Starts a transitional period lasting a few hundred years. 2100 BC Uruk expels Gutians representing a revival of the Sumerian culture, but lost the hegemony of the region to the city of Ur. 2000 A.C. Ur was destroyed and looted by the Amorites. This page was last modified on 26 October 2015, at 00:39.